Hapag-Lloyd AG is a transnational German-based transportation company. It is composed of a cargo container shipping line, Hapag-Lloyd AG. The container transport arm of Hapag-Lloyd AG is currently the world's fifth largest container carrier in terms of vessel capacity. The company was formed in 1970 by the merger of two German transportation/maritime companies, Hamburg America Line (HAPAG), which dated from 1847, and Norddeutscher Lloyd (NDL) or North German Lloyd (NGL), which was formed in 1856. Since its formation, Hapag-Lloyd has been sold to many organizations and has also undergone numerous mergers with other companies. For instance, Hapag-Lloyd was completely acquired by, and became a subsidiary of TUI AG (Hanover) in 1998. 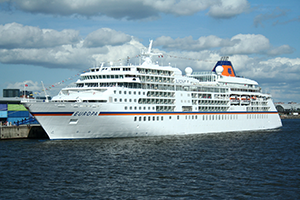 This major event was followed by TUI selling a majority stake of Hapag-Lloyd to various private investors in Hamburg in 2009 and again in 2012. Other important events in the company's history include Hapag-Lloyd's acquisition of CP Ships in 2005 as well as Hapag-Lloyd's merger with CSAV in 2014 and United Arab Shipping Company in 2017. Currently, the companies shares are owned by several public and private investors, with the largest stake controlled by CSAV. Hapag-Lloyd was formed in 1970 through a merger of Hamburg America Line (HAPAG) and the North German Lloyd. The Hamburg-Amerikanische Paketfahrt-Aktien-Gesellschaft for shipping across the Atlantic Ocean was founded in Hamburg. In 1912, Hapag built the first of their "Big Three" ocean liners; the Imperator, followed by her sister Vaterland. The third sister, Bismarck, was under construction at the outbreak of World War I and was completed after the war for White Star Line as the Majestic. These were the first liners to exceed 50,000 gross tons and 900 feet in length. During World War I, the majority of Hapag's fleet of 175 ships were wiped out, and most of the surviving ships (including the "Big Three") had to be turned over to the winning side as war reparations. After war's end, Hapag rebuilt its fleet with much smaller ships than before the war, but their fleet was again mostly wiped out during World War II, with surviving ships turned over to allied powers. Norddeutscher Lloyd (NDL) was formed in 1856 in the City-State of Bremen, offering passenger and cargo transportation between Bremen and New York, with an emphasis on emigration to the United States. Service started in June with the Bremen, the first of three steamships, and the company established its American base at Hoboken, New Jersey. NDL eventually built a large fleet of ships that carried many thousands of emigrants westwards, with a peak of 240,000 passengers across the Atlantic in 1913 alone. The outbreak of World War I resulted in the internment of its 135-vessel fleet at Hoboken, which status was changed to confiscation when the US entered the war in 1917. Likewise, its Hoboken base was confiscated, and turned over to the US Navy, which used it as a transshipping point for the duration. Operations were resumed in 1922, when NDL was able to purchase its former base from the United States Alien Property Administrator. NDL launched a new Bremen and Europa in 1929–30. At the start of World War II, NDL repeated the World War I experience, with its fleet again being confiscated when the US entered the war in 1941. The lone exception was the Bremen, which raced across the Atlantic, and achieved protection at Murmansk in 1939, later moving on to her namesake city where she remained for the duration of the war. 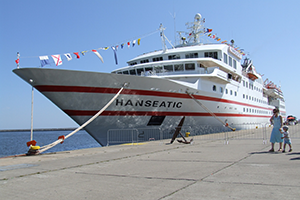 Passenger service resumed in 1954 with the MS Berlin, formerly the Swedish American Line's Gripsholm. Later two other second-hand ships, SS Bremen (formerly Pasteur) and MS Europa (formerly Swedish American Line's Kungsholm), were purchased. Service continued as before, but it was decided that there were too many competitors in a transportation environment where the airliner was taking the most frequent customers away. This resulted in NDL’s merger with the Hamburg-America Line in 1970. NDL attained several speed records over the years. Among them, was the record for the run between Southampton and New York of eight days in 1881, which was set by the Elbe, and held until 1900; and the record for the fastest transatlantic crossing set by the new Bremen in 1929. Hapag and NGL continued to compete until establishing a joint-venture container line in 1968 in order to share the huge investments related to the containerisation of their fleets. Both companies finally merged on September 1, 1970 under the name Hapag-Lloyd. Hapag-Lloyd was acquired in 1998 by TUI AG (Hanover), a tourism conglomerate, and became its fully owned subsidiary in 2002. In the course of the integration into TUI AG, all tourism-related activities such as the charter airline and travel agencies were transferred to TUI AG. A retrenchment from that position through an offering of a minority of Hapag-Lloyd's shares on the stock market was planned in 2004. As part of that process, its business units other than the container line and cruise line were planned for divestiture. In 2008 TUI announced an intention to sell its entire stake in Hapag-Lloyd shipping activities before the end of that year. Industry speculation predicted a sale price of approximately $US5.9 billion. Hapag-Lloyd founded the charter airline Hapag-Lloyd Flug in 1972, buying a few Boeing 727s to fly its cruise passengers from Germany to the cruises' ports of call. The airline eventually added some regular passenger flights as well. Hapag-Lloyd Flug used the IATA code HF and became a directly owned subsidiary of TUI AG in 1999. In 2002 TUI AG initiated Hapag-Lloyd Express (HLX), a low-fare, high-frequency airline. However this eponymous company was never owned by Hapag-Lloyd. Since their merger in July 2007, both airlines trade as TUIfly and use the IATA code X3. On 21 August 2005, TUI AG agreed to acquire the Canadian business CP Ships Limited for €1.7 billion (US$2.0 billion) in cash. The deal which was approved by the boards of both CP Ships, TUI, and the Shareholders has been successful. It has now made the combined fleet the fifth largest by capacity in the worldwide container shipping market. In 2006 the CP Ships name disappeared for good. In 2013, Hapag-Lloyd announced it was considering the possibility of a merger with its smaller compatriot Hamburg Süd. The merger plans were scotched when Hamburg Süd's shareholders and owners did not agree to the final offer made by Hapag-Lloyd stakeholders. After this event, Hamburg Süd remained a private, independent company until December 2016, when the container transport division of Danish logistics and energy company; Maersk, announced it would purchase Hamburg Süd at a price of 4.02 billion USD. In 2014, Hapag-Lloyd acquired Chile's Compañía Sud Americana de Vapores SA (CSAV). The merger made Hapag-Lloyd the fourth-largest container-shipping company in the world. In April 2016, Hapag-Lloyd announced it was in merger talks with the United Arab Shipping Company (UASC). The merger was agreed upon later in 2016 and the integration between the two companies was completed in 2017. At the time of the merger, UASC was reported to be the world's 10th largest liner shipping company with a fleet of 56 ships and a market share of 2.7 percent. As a result of the merger, Hapag-Lloyd became the world's fifth largest container transporter in terms of vessel capacity, surpassing Taiwan's Evergreen Line. The merger also meant that UASC would become the largest shareholder in the new mega-entity, but Hapag-Lloyd would become the sole operator of the combined fleet. Historically United Arab Shipping Company was jointly established in July 1976 by the six shareholding governments of the Arab states of the Gulf (Bahrain, Iraq, Kuwait, Qatar, Saudi Arabia, and U.A.E). Originally based in Kuwait, its corporate headquarters then moved to Dubai during the Iraqi conflict, and only some departments were moved back after the war. The UASC fleet operated more than 18 services, connecting the Middle East to Europe, the Mediterranean, Indian Sub-continent, Far East, West Africa, and the Americas. Its network covered over 200 ports, offering containerized and conventional cargo shipping by a fleet of 52 owned and chartered vessels. On June 29, 2016, UASC’s six shareholding states voted unanimously to approve the proposed merger. The deal gave a relative valuation of the two businesses at 72 percent for Hapag-Lloyd and 28 percent for UASC. At the time of the merger, UASC was 51 percent owned by Qatar and 35 percent owned by Saudi Arabia government, with the remainder held by other Arab states. Hapag-Lloyd's cellular vessel fleet and TEU ownership ranks fifth globally in terms of capacity, ahead of Taiwan's Evergreen Line and behind China's Cosco Shipping. Hapag-Lloyd transports containerized cargo on several major trade routes around the world. It has a prominent market presence and brand recognition in Latin America, the Middle East, trans-Atlantic, and trans-Pacific trades, among others. Hapag-Lloyd is currently the largest member of the Transport High Efficiency vessel-slot sharing alliance, which was created in April 2017 and also includes Taiwan's Yang Ming Line and the Japanese carriers Kawasaki Kisen Kaisha, Nippon Yusen Kaisha, and Mitsui OSK Lines. 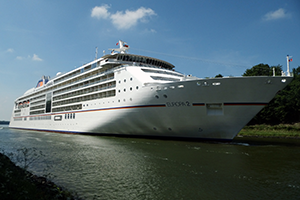 Offers international cruises on several vessels. Private jet services also available to customers. MS Europa (1965) - 1970-1981. MS Finnstar - chartered 1979-1980. 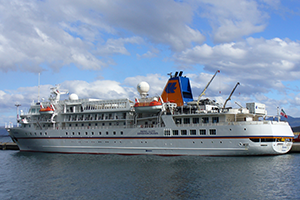 MS Europa (1981) - 1981-1999. MS Columbus 2 - chartered 2012-2014.